Have you ever tried cooking your favorite meals in a paper bag? If you haven’t, I suggest you give it a try. It’s convenient, less cleaning, and you will be pleasantly surprised how delicious the food will turn out … just as great! 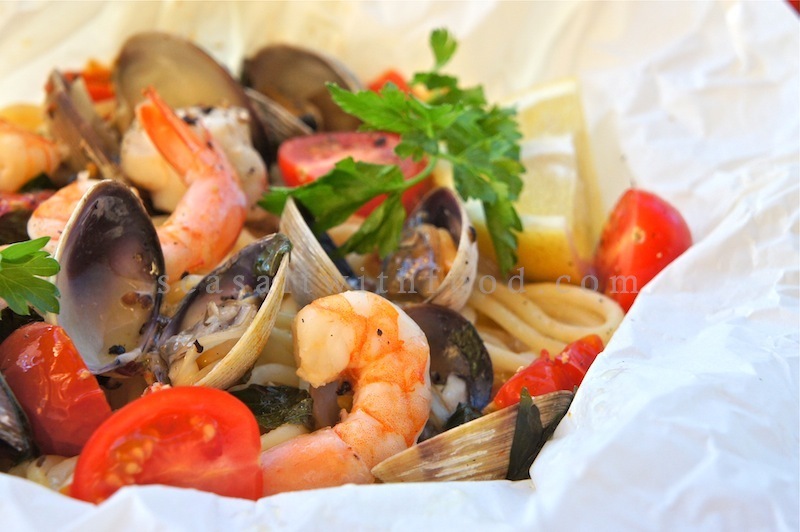 Today, I am sharing one of my easy seafood pasta recipe that’s cooked In paper bag. There’s no fuss here, just cook the pasta according to the packaging’s instructions, or until al dente. Then, arrange them in a parchment paper, toss in all the ingredients, wrap it up, and tie it with kitchen strings. 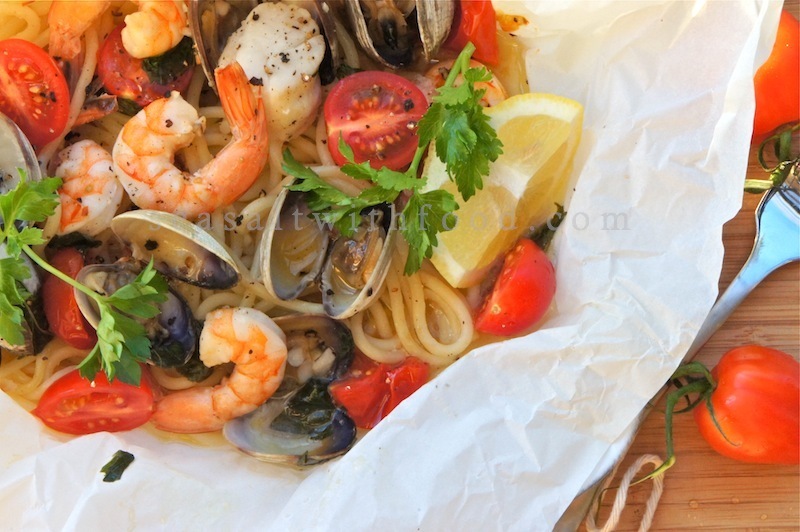 Place it in the oven for about 20 minutes and you have a bag of delicious seafood pasta waiting to be enjoyed. Yum! I'll try this for BBQ, but I need to wrap it the paper bag in an aluminium bag first. Oh, I've never heard of doing this before! I'd love to, it seems there would be a ton less dishes. The parchment doesn't get soggy and rip? Love this method as it seals in all the flavors and moisture. I love that cooking method. Great recipe. Oh, you had me at the title. Sounds so so good! And looks delicious too. Thanks for a great post - I just bookmarked the recipe! How interesting. I have cooked fish en papillotte whic is tehnically just in a bag and it tastes wonderful but nevr thought to do it with pasta. How fun! Looks sensational. Your pictures and recipes had me so caught up, I dint realize the comments down below. Well, hoping to cook some great stuff through here. Yum! I eat pasta for practically every meal :) My favorite fall pasta dish, though, is this pumpkin and goat cheese lasagna! I made it once and I've been hooked ever since!